With tuition costs steadily rising, it’s hard to imagine what your child will have to pay for college in a decade or more. Knowing this, it’s really no surprise that 45% of parents are saving money toward their child’s college education, according to the 2014 College Savings Foundation Executive Summary. As a parent myself, I can vouch for the fact that one look at a college expense calculator and I’m ready to run for the hills and take my kids with me. When I sit down and really plan it out though, saving for college isn’t scary and even relatively small amounts really make a difference. There’s a big misconception that in order to make a dent in the cost of college you need to save massive amounts of money. It just isn’t true. In fact, the earlier you get started, no matter how much you’re saving, the better off you’re going to be. Here’s one example proving this point. Parent # 1 saves $50/ month from the time his child is born until age 18 and ends up with $21,165 assuming a 7% rate of return. Parent #2 saves $100/month from the time her child is age 9 to age 18 and ends up with $14,913. Again, assuming a 7% interest rate. In this example the same exact amount of principal was saved by both parents. Each parent saved a total of $10,800 but because parent #1 started early he got to benefit from compound interest! It’s easy to see that no matter the amount you’re saving the earlier you start the better. Put money in your child’s 529 plan whenever feasible. The more you can stash away in the beginning the more time that money will have to work and grow for you. But What If I Don’t Save Enough? Another big concern simply holding many parents back from saving is that, no matter how much they save, it just won’t be enough – so why bother? 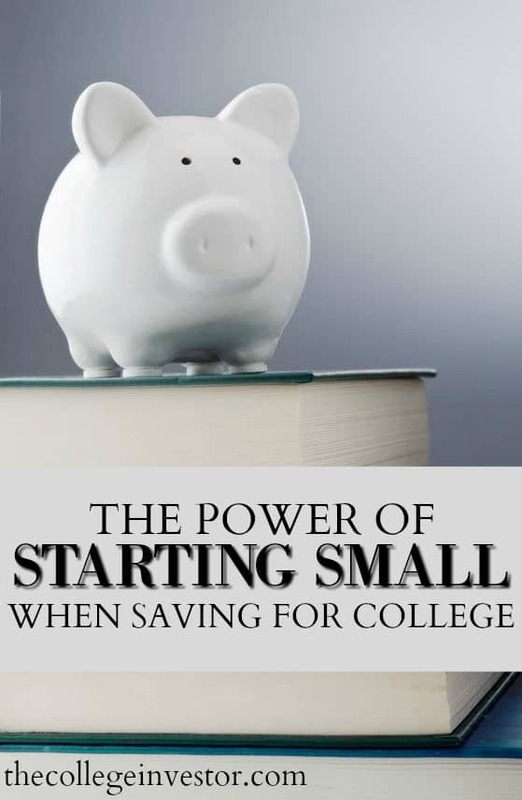 If you take that into consideration, and the fact that the College Board found the average tuition and fees at in-state public colleges to be $9,410 in 2016, suddenly your small savings becomes a big benefit. If you take the current cost for tuition for one year, and increase it a little each year, you can reason that tuition will likely be about $40,000 for 4 years at an in-state public school. If you’re Parent #1 in the above example, you’ve saved over 50% of the cost of school – and will be contributing more than the national average. Then you’re only looking to cover about $19,000 in expenses, which could come from a combination of scholarships, grants, and student loans. That’s a much easier number to work with, simply because you saved earlier. Squirreling away money for your child(ren) every month is great, but if you’re not able to contribute as much as you like don’t beat yourself up. There are several ways to fund a college education and not all of them depend on the bank of Mom and Dad. Here are seven of the most popular ways to fund a college education that you need to take into consideration when mapping out a college savings plan. 529 Plan Savings – A 529 Plan is a college savings plan that allows contributions to grow tax free as long as they’re used for eligible education expenses. The ScholarShare Plan in California is a great way to get started for both residents and non-residents of the State of California. Scholarships – There are scholarships for just about every interest and vocation under the sun. One of the first places you should look for scholarships for your child is through you or your spouse’s employer. Here are other ways to get college scholarships. Current Income from the parent – It’s possible that by the time your child enters college, you’ll have extra income freed up that can go toward this expense. Current income from the student – There’s nothing wrong with having your student work part time through college to help foot the bill. Grandparent, Relatives and Friends Gifts – Instead of having friends and family purchase your child regular gifts ask for contributions to a 529 plan. All of these smaller contributions can add up to something significant over the long run. ScholarShare has gift certificates that you can purchase, so that your family and friends can still give something physical at parties. Student savings – In addition to you saving in a 529, your student can use proceeds from their jobs during the high school years to help cover some education costs. Student loans – While many parents are scared for their children to begin adult life with student loans, they DO serve a purpose. At the end of the day, getting a college education is an investment in a person’s earning power and student loans are sometimes the cost. The most important thing is to borrow smart. While it’s noble to want to fully fund your child’s college education, it’s not worth risking your own financial security. Do the best you can and realize that there are plenty of ways for your child to pay for college beyond your input. Even the smallest of contributions can really add up when saving in a 529 plan. And when you have your savings paired with other ways to fund college you can make a huge difference in the amount of student loans your child will need to take out. Robert Farrington is a brand ambassador for ScholarShare and this article was sponsored by ScholarShare. All opinions are my own. This is really helpful, especially for people who are not wealthy and feel like they will not be able to help their kids with the cost of college. I’m a long way off from having children but I am definitely going to do this! This same idea applies to saving for anything really – it’s always easier to start small and save longer, than it is to wait and have to save a lot more money. An excellent reminder in the power of compound interest. Little bits now can make a huge difference later on. Parents can help their children out a lot by putting away even a little bit every month as you recommend. I do hope that the pace of college inflation starts to drop in the coming years, but either way I plan to start putting away early if my wife and I decide to have children. I sure hope that college costs stop rising as well. But you’re right, compound interest is a powerful force, and it works with time. Yes! This is why we are saving small amounts for our twins whenever we can. We want them to be able to use the money for things other than just college though if they decide that isn’t the route for them, so we are using a different type of account with the same principle of compounding interest working in our favor. Curious as to what your strategy is to save outside of a 529? Michigan is one of the states that also allows contributions to be tax deductible from your State income tax. It seems so easy when you put it this way – $100 per child per month since the day they are born will fully cover 4 years in-state for my alma mater! And don’t forget that you can put gifts your child receives into the 529. So, instead of $1,200 per year, you might only need $600 per year if you get $600 in gifts for Christmas and birthday.